Stems: Erect, unbranched or branching above, rough. Leaves: Opposite, simple, short-stalked, ovate to broadly lanceolate, 2 to 6 inches long, 1 to 3 inches wide, firm, usually rough, often with 3 conspicuous veins arising from bases; margins toothed; tips pointed. Inflorescences: Heads, 1 to several, terminal, on long naked stalks, 1.25 to 2.75 inches wide; bracts ovate, in 1 or 2 series, pubescent; tips rounded to pointed. 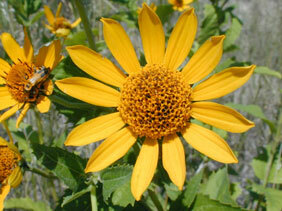 Flowers: Ray florets 10-16, to 1.5 inch long, dark yellow; disk florets numerous, corollas yellow. Fruits: Achenes, less than 1/4 inch long, 3- or 4-angled, glabrous, reddish brown, tipped with short crown or pappus absent, enclosing small seed. Habitat: Dry, waste areas, roadsides, open woods, and edges of fields and thickets. Comments: Livestock and deer sometimes graze ox-eye.